It’s already about a month into the new year. How are your resolutions doing? No, you don’t have to answer that. If you’re like a majority of resolution makers, odds are relatively high that your goals have already fallen by the wayside. You’re in good company with that, as a majority of resolutions tend to fail by mid-February! While it is always worthwhile to try losing weight and be more active, it can be difficult to really pursue those goals if something is impeding your progress. Persistent heel pain can be a real showstopper in these areas, but it doesn’t have to stop you any longer! Even if you have already fallen off your New Year’s resolution this year (or didn’t even make one at all), why not make a commitment to get rid of your heel pain in 2019, then really get started on those other goals? Getting rid of your heel pain for good might feel like a daunting task, especially if you have already tried one or two ways that haven’t worked. But don’t worry; with our help, this resolution might be easier to keep than you expect! One big weakness a lot of people have in their standard New Year’s resolution is lack of a real plan. For example, some people might say “I’m going to eat better,” but don’t really establish a plan of what they should eat throughout the week or how to prepare it. It all begins to feel more and more directionless and motivations fall apart. Then, they suddenly realize they’ve eaten their way through an entire column of Oreos during one episode of Stranger Things. When it comes to heel pain, there’s a lot that must be known and planned out to find lasting relief. Many people tend to treat heel pain as the entirety of the problem in itself, believing it can be treated with any standard store-bought insert or remedy on the shelf. Most often, these people end up still in pain and very disappointed. 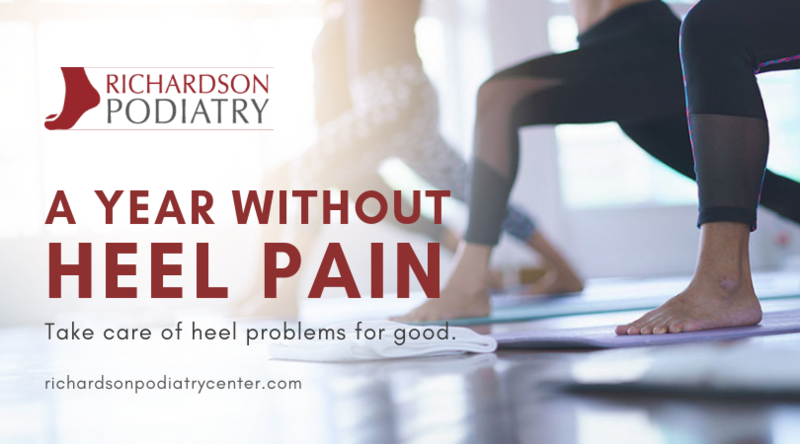 That’s because heel pain isn’t just “heel pain.” It can stem from a variety of different conditions, which in themselves may have several different causes. To properly treat heel pain in a significant way, we must get to the source of the problem and address it effectively. For instance, your heel pain could be the result of plantar fasciitis, the inflammation of the thick band of tissue that runs along the underside of each foot (if your heel pain is particularly awful as soon as you get up in the morning, this is a likely cause). Or it could be Achilles tendinitis, inflammation of the tendon connecting the heel bone to your calf muscle. These conditions and others (bursitis, heel spurs, nerve pain, etc. ), each require a different approach toward treatment. Many times, different treatments may be required for the same condition, depending on how it was brought about! If your plantar fasciitis has been a result of putting too much repetitive stress on your feet (are you pushing yourself too hard while running, perhaps? ), that may require a different approach to treatment than if it’s the result of an abnormal foot shape placing too much daily pressure against the area. Sometimes, both of these factors can be at play at the same time! This might sound complicated, but don’t worry. At Richardson Podiatry, we have literally written a guide to heel pain. We have had many years of experience diagnosing and treating conditions that cause these types of discomfort, and we can find the best forms of treatment that fit best with your individual needs. As noted earlier, each approach to treating heel pain can be different. We not only take the specific condition and causes into mind, but also your lifestyle and daily needs. Custom Orthotics. In cases where an abnormal foot structure or gait is contributing to your heel pain, we may prescribe custom-made orthotics to provide the right structure, correction, and support needed. Store-bought orthotics just aren’t made to address these needs as specifically, which is why they don’t often work. Exercise Changes. If heel pain has been the result of active overuse, we will help you reduce your activity level to something that is still challenging, but allows your body more opportunity to condition itself and grow stronger. Stretching and warm-up exercises are also essential to preventing future injury. Lifestyle Changes. If you are overweight, losing pounds will take excess stress off of your heels. If you spend all day standing on your feet, a change in footwear or the use of cushioned mats where you stand can be a significant help to your endurance and comfort. Medication or Steroid Injections. In cases where pain is particularly limiting, certain medications or injections may be used to lessen pain and inflammation, further promoting recovery. Rest and Icing. They’re tried and true; a good complement to many forms of heel pain treatment. If conservative measures have not yielded the results we are looking for, then (and only then) might surgery be considered as an option. If that point is reached, we will be sure to fully discuss all the pros and cons of a procedure so you can decide in full confidence whether it is a route you wish to take. No matter how long you have suffered from heel pain, something can be done to provide you more comfort and less hindrance in your daily life. Make this the year you set to take on heel pain once and for all! Richardson Podiatry Center is located on North Collins Boulevard and is always happy to see new patients. Call us at (972) 690-5374 to schedule an appointment.